Keith Chegwin, who has died aged 60, had a career spanning five decades. Here's a look back at some of his memorable moments. Before becoming a television presenter, Chegwin appeared in many TV, film and stage productions as a child actor. They included Roman Polanski's film Macbeth and TV shows Z-Cars and The Adventures of Black Beauty. Chegwin rose to prominence presenting Swap Shop alongside Noel Edmonds and John Craven from 1976. Maggie Philbin joined the team as a co-presenter in 1978 - she was to become a significant part of Chegwin's life as the pair later married. 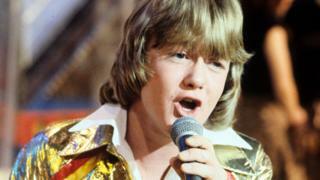 In 1978 Chegwin had success fronting his own show, Cheggers Plays Pop, a game show broadcast on BBC One. Chegwin married his Swap Shop co-presenter Philbin in 1982. The couple had a daughter, Rose - named after the editor of the programme, Rosemary Gill. However, the couple were later to divorce. Along with the other Swap Shop presenters, they formed the one-hit wonder band Brown Sauce and had a number 15 hit with I Wanna Be A Winner in 1981. Chegwin disappeared from TV screens for a number of years during a battle with alcohol, but he made a comeback as a co-presenter on Channel 4's Big Breakfast in the 1990s. Although only appearing in the show from 1995 to 1996, it reignited Chegwin's career. In 1995, he also appeared in the film The Perfect Match, a comedy about a marriage proposal being broadcast to a crowd of football fans. He later went on to appear in Shaun of the Dead in 2004. In 2008, Chegwin appeared in Ricky Gervais' and Stephen Merchant's hit show Extras. "He is one of the most generous performers I've ever met," Chegwin later said of Gervais, adding: "If he writes a line that's funny, he will give you the line instead." Three years later, Chegwin was involved in another comedy series courtesy of Gervais and Merchant. Life's Too Short starred Warwick Davis and also included cameos from Johnny Depp and Liam Neeson. Chegwin was originally set to take part in the sixth series of Dancing on Ice, but was forced to withdraw after breaking three ribs and fracturing his shoulder on the first day of training. He eventually joined the eighth series of Dancing on Ice, broadcast in 2013. Later that year, he appeared in Imperial Ice Stars: The Nutcracker on Ice performance, playing Drosselmeyer, the toy maker, at the London Palladium. Chegwin appeared in Celebrity Big Brother in 2015, finishing fourth on the reality show. While in the house, he struck up an unlikely friendship with glamour model Katie Price, later describing her as a "friend for life". He also said the show made him more tolerant as a person. "Celebrity Big Brother has made me more willing to put up with people and their tantrums," he told the Liverpool Echo. Later that year, Chegwin also appeared in the BBC's Celebrity Masterchef, along with singer Chesney Hawkes and Girls Aloud's Sarah Harding. He was also a panto stalwart, his last appearance being Jolly King Cheggers in Beauty and the Beast earlier this year.